I love reading on my iPhone because if there is anything I don't know and want to look up, I can simply switch apps and google it without loosing where I was reading. I did that this past weekend and got a great little nugget that I wanted to share. Since I am currently in Leviticus, I was curious about the different offerings and decided to look it up. The commentary I was reading began talking about the priests and how big of a deal it was when they sinned as opposed to anyone else sinning. He used this analogy to explain it and I think it is a great word picture. He said, "The more prominent the man, the more flagrant the sin. A man in public office is very much like the town clock, as more depends on it than on the watch of the individual. If a man's watch goes wrong, only he is misled; but when a public clock is off, many are led astray!" Wow what a challenge to all leaders! My life and "secret sins" that I think no one knows about doesn't only affect me. It affects many around me, even to the point of leading them astray. When I read this, I pictured a whole town going crazy, people confused and getting frustrated. I know my sin does that to me. I hate the idea of my sin causing a person to wander in confusion or frustration because of something in me not correctly mirroring or honoring the scripture. I don't think it's just obvious sins either. It can be in my pride of disobeying God in the small things I know he's told me to do, or when I choose to live by my emotions and own logic rather than the Spirit. Even if you are not in church leadership, you are still leading someone - your wife, kids, grandkids, a co-worker, a school mate, etc. So let's allow God to search and test our hearts and make the necessary changes he points out to us. The lifestyle of every busy mom is "on the go." If you are very busy, you can do many things on the go. You can eat on the go, discipline on the go, shop on the go, teach on the go, and I've discovered you can even potty train on the go! After our big potty weekend, Isaiah wasn't completely ready to take on the world with undies only, so we had to bring our little potty with us. It's actually way less stressful than quickly and desperately trying to find a nearby public toilet. It's probably cleaner too. So when we're out on the road, we dump, wipe, and go. 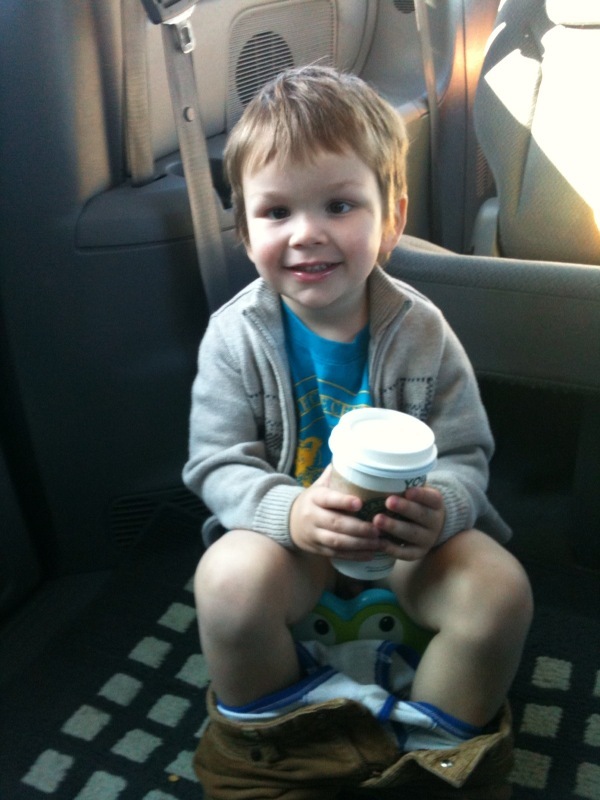 Also Isaiah loves coffee, so here he is enjoying a tall Chi Tea Latte from Starbucks while he takes care of business. Some people read on the pot, others Latte. About three days ago, in keeping with our potty updates, Isaiah's #2's were a little stuck. He sat on the potty about 6 times with cramps before he finally unloaded. Just in case there was more to follow, I left his underwear off so he could run to the potty and handle his business. Unfortunately, after I had flushed and cleaned out his potty, I forgot to put it back so when Isaiah's second round came about, he ran to his potty but there was no where for him to put it, so he squatted right there on the kitchen floor and did what he had to do. Here's where Oscar comes in. If you don't know this about dogs, they LOVE human poop. Before I could get to it, he quickly ran up and devoured it. He even licked the floor clean for me. What a thoughtful little puppy! Today, the boys and I went grocery shopping. I was in a hurry to go to church, so I put all of the grocery bags on the table and only emptied the cold stuff into the fridge (so I thought). Apparently I had left the lunch meat out. While we were gone, Oscar helped himself to 3/4 pound of shredded turkey, then left us a few little packages around the house to clean up. As I was cleaning it, Judah caught a whiff and threw up!! So here I am cleaning up dog poop and Judah's throw up. Thanks Oscar. Well we finally finished the potty training weekend and we all made it out alive! Isaiah has definitely been the hardest to train. I only remember a few accidents with Gabe, none with Judah, and it's already been many with Isaiah. He's doing great with #1. It's #2 that he's not quite getting. So needless to say it's been messy. I think he's marking his undies so everyone knows which ones are his and he doesn't have to share. I can't say we're out of the weeds yet, but we're getting there. Now onto the Big Bad Budget. Like I've said before, I haven't been too good with sticking to the budget but my New Year's goal is help us get completely out of debt. Yesterday was my first ever real live test. I went to the grocery store with NO CARDS to back me up. CASH ONLY. I have to say I was really nervous. I feared that I would get up to the checkout and bomb. 2. Have just enough money for taxes and all. Only in this case can you thank God for #2 (not in the instance described above). I didn't get everything I would have gotten if I had an endless amount of money to spend (which I have never had, just acted like I did), but I did get what I needed for the week. I wish I could say, "It felt great to stay on the budget and make the right choices" but it didn't. Not yet anyway. I realized through this shopping experience that I have never paid this much attention to prices and how selfish I had been. I also know this will be a new season of self-denial for me. I won't be able to get whatever my little fancy desires and I'll have to be ok with it. I know the key is keeping an attitude of gratitude for all the blessings I do have. Being negative and grumpy will kill the life inside of my heart, kill the life in my marriage (you how know men get sick of complaining women real fast, but who can blame them? ), and impart a sense of ungratefulness and frustration inside of my kids' hearts. I want them to be thankful and content, like Paul says in Philippians 4:11, no matter what they ever have or don't have throughout life. So in this season, I will consistently feel the resistance to either let myself have it's temporary way and mess up our budget, putting us further in debt, or deny myself and help us get freedom from our financial chains. I hope I can learn to do the latter. Today was the first of three days for Isaiah's potty training weekend. Before I potty trained Gabe, I discovered a book called Toddler Wise. One chapter talks on potty training. What I really liked about the book was that it gave three different approaches to potty training. You have the option of potty training your child in 3 days, a couple of weeks, or over a long period of time. You choose which one works best for you based on your lifestyle and personality. The 3 day "Big Potty Weekend" works best for me. I get the other boys out of the house and do nothing but potty train. By the end of the weekend, they are completely out of diapers. It's interesting how all three boys trained differently. Gabe was not interested at all. I had to make him do everything and I was pregnant with Isaiah at the time so my emotions were rockin! Judah was so compliant and easy I think he could have trained himself. Isaiah, to no one's surprise, has been a bit of a challenge. He wants to do the opposite of everything I tell him to do. He was acting so silly today and laughing about everything which was driving me crazy because I am a serious person and I wanted him to focus. Not him. The whole thing has been a game to him. After our long nap together (that we both needed), we were off to a better start. He finally got the hang of it. I think tomorrow will be much better. By Sunday, he should be completely trained and as he likes to say, "NO MORE DIAPERS!!!" 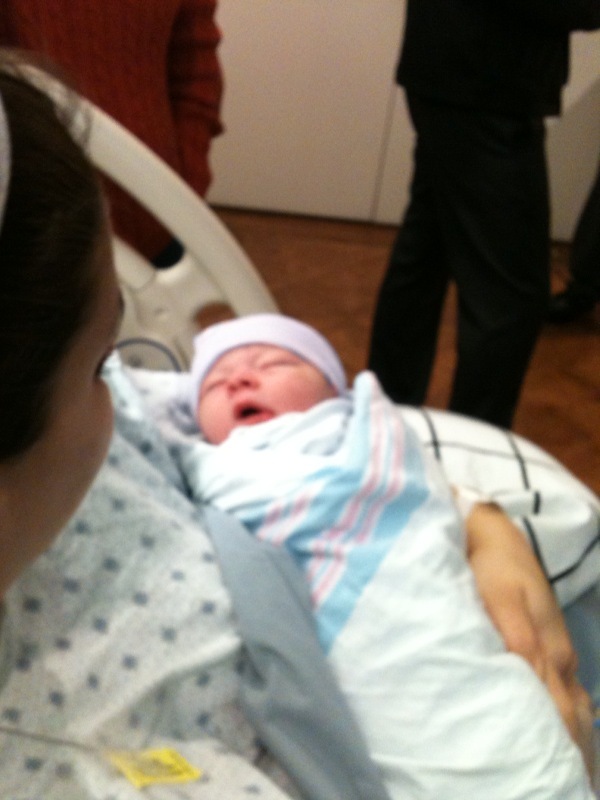 amazing job and Tristen came out perfect!! So I know this is bad but I was sooo sleepy today and I drank a Red Bull. The bigger boo boo was that I drank it around 4pm and it is currently 1am the next morning and I am wide awake! I did everything I could think of to prepare for tomorrow, I cleaned up around the house, I wrote down tons of stuff swirling around in my head, and now it's time to write a new blog. I absolutely love my iPhone Apps, so I thought I would share my top three with you. My first favorite App is the daily broadcast of Focus on the Family. It's only about 30 minutes so I usually listen to it on the road. I crank up some fun music for the boys and put it on the back speakers while I listen to my daily broadcast. James Dobson is no longer on it, but it is still so insightful. I have learned so much about marriage and parenting just in the last month. You just go on it, look at the titles, and listen to the ones you like. After listening I always feel encouraged that I'm either on the right track or inspired to make necessary changes. I think everyone should listen to it no matter what stage of life they are in and I'm pretty sure it works the same way on their website. My second favorite App is a pregnancy one. There are little tidbits of info everyday for me to read about the baby's growth or mine. There is a checklist to remind me to take care of myself and the baby and even informational videos. My third and newest favorite App is a Crockpot App. I actually just got it (literally just now), so I haven't tested it out yet but it looks awesome! Since life has gotten busier for us in the Vogel family, I have discovered and come to love the Crockpot. I have also been on a mission to try new things in it and cook food in better ways to make it taste better instead of bland and typical. I have seen a couple of Rachael Ray shows about how to improve Crockpot dinners which have helped. Just last week I was in the checkout at a grocery store and saw a small Crockpot recipe book. Apparently you can do drinks and breakfast in the Crockpot too! That is where I found out about this App. It has top recipes and seasonal dishes. You can choose what kind of cuisine you want like French, German, Italian, etc. There is a random recipe button that shuffles and lands on a random recipe if you just can't decide what to cook. There are a few personal things like a shopping list, family favorites, and what you are cooking for dinner that night. There are tips on all kinds of subjects and so much more! I really think I'm gonna love it. It's great to be informed and improve on the important things in my life and the best part about it is that all three of these Apps were free and have changed my life in one way or another. Who dat say they gonna beat them Saints? The Seattle Seahawks. With 41/36, it was a sad day in New Orleans. We had a great time hanging out with family though. We went to Aaron's brother & new wife's house for a delicious BBQ. Aaron's mom, Honey, made them their adorable t- shirts with the Saint's logo. So even though we lost last night, we all looked good do it. Looking forward to next year! I'm sure by now everyone has heard that we are having a baby girl. That day and the days leading up to it were crazy. I couldn't sleep. Everyone kept asking what it was. I kept having dreams about it being a boy. I was so torn about even finding out. I figured if it was a boy, I'd rather not know early and find out in four months when I could hold him in my arms. But of course the teeny tiny chance that it could be a girl made me need to find out and I'm so glad we did. I'll never forget that image moving around on the screen. The most beautiful thing I've ever seen were those little legs with nothing in between them. It was glorious! Immediately after finding out, cyber space was informed and it felt like the whole world knew. We received so many txts and phone calls, I thought my phone was going to blow up! Since that day I've been having a blast looking up all sorts of things to replace with the ultimate girly patterns (strollers, car seats, diaper bags, highchairs, clothes, etc). Everything I've ever said I would get "if I ever had a girl" are going to come to pass. I can't wait for the dresses, bows, patent leather shoes, ruffled socks, bloomers, and jewelry. I am anxious to make necessary changes in each room so everything is completely ready well before she arrives. The road ahead is going to be a blast! I personally don't like making New Year's Resolutions. Some people are driven by goals. I am not. I've realized I'm more like a snail. I'll eventually get there, but it'll take me a little while. One woman in our church once told me that she makes one goal a year. Her goals are to make real, habitual changes in her life, not general goals like joining a gym or eating healthy. Habitual changes take time because you are changing who you are. A few examples might be eating only one sweet food a week or a month, stop drinking soft drinks completely, exercising once a week or more, eating one vegetable a day, eating only fruit for breakfast, spending 5-10 minutes every morning reading the Bible, waking up and going to bed early. This way, after five years, you have changed five lasting things about yourself in a healthy, progressive direction. I like that. I think it's wisdom. Of course this doesn't mean that you can only make one, but it's a great start. This past year was rough for me. It marked the one year anniversary of my dad's death, my first child starting school, I finally got pregnant, Aaron transitioned jobs from full-time ministry to a full-time career, and we officially decided we are going to move to The Covenant House in Florida. I do like the idea of a new start because those changes were great but challenging. This year we will encounter many more changes. Having a new baby and moving to Florida are going to contain a slue of changes in our family and in many people's lives. So here are a few of my personal goals for 2011. One of my "marriage goals" for this year is to have a consistent breakfast/lunch date with Aaron instead of the typical dinner dates. I'm too tired at night now and I really enjoy breakfast foods and visiting new places for lunch. I think this will work well for us but it will take time to plan and transition our way of thinking. Eventually I want to be focused on investing spiritually into my boys, but for this year a major "mom goal" for me is to exemplify a positive attitude, patience, and not reacting out of frustration towards my boys. Over the past four months I have changed in this area, but I still have a ways to go. I want them to remember me as a person who had a great attitude and was fun to be around. This will probably take me the whole year, but I know it's possible. A "spiritual goal" I have is to continue reading my daily Bible reading. Maybe this year I will finish the whole thing! I've recently been going through The Purpose Driven Life on CD and I love it. I have recently learned a lot about living in community, being vulnerable to others, and consistently investing in important relationships. Last year I didn't understand the investment aspect and I can see that I missed out on the depth of relationships that we all need and desire. A "ministry goal" I have this year is to invest a lot of time with the girls on our leadership team. I used to assume they didn't need me or if they did they would come talk to me, but that wasn't true. I know we all need someone we look up to who cares about our lives. So whether they need me or not, I will be there, getting to know them more, and helping to guide their lives. A "financial goal" I have this year is to stick to our budget. I have not taken this seriously. I have not been out of control and I can say that I have let go of a lot of material "needs" in my life that most people think they have to have, but I have not been proactive, living a self-denial lifestyle financially. Aaron has some very specific financial goals to get us in the best position possible for our move to Florida and I want both of us to work toward that goal together. I will take one month at a time, but it will definitely have to be a change in my mindset, not just a lack of spending. Growth and change are a part of life, so this year don't be like most people and make random goals that you probably won't keep. Focus on making habitual changes in your spirituality, attitudes, character, relationships, and health that will last. Happy New Year and happy changing! !